The Atmos Complex is a group of prominent structures that have remained empty on the east end of downtown Dallas since 2005. The complex — filling an entire 2.6 acre block bounded by Harwood, Jackson, St. Paul and Wood Streets — contains 2 buildings that are contributing structures in the Harwood Historic District. The 1924 Dallas Gas Company Building and 1931 Lone Star Gas Company Building are joined to the 1966 West Building and 1979 Enserch Plaza Building. Together the complex contains 401,300 square feet of floor space. The complex began in 1924 as the headquarters for the Dallas Gas Company, later purchased and expanded by Lone Star Gas (the predecessor to TXU Gas Company) from 1927-2004. What began as one 4-story building grew through a series of additions and newer buildings (similar to the development of AT&T’s complex a few blocks away). In 2004 TXU sold the buildings to Atmos Energy, who gifted the complex to the City of Dallas upon their departure in 2005. As part of a plan to bring residents downtown, the City of Dallas came to an agreement with Forest City Enterprises (developer of Mercantile Place on Main) to re-purpose the building. Due to the economic situation and lending issues, Forest City passed the project on to Hamilton Properties (developer of the Davis Building, DP&L and Mosaic) in 2008. The current plan (not without controversy) hopes to combine Section 108 loans and tax credits to create a project with about 50-50 affordable and market rate housing. On a Saturday in July John Greenan (executive director of Central Dallas Community Development Corporation) gave us a brief tour of the historic buildings, revealing a glimpse of the craftsmanship that — for now — remains hidden behind closed doors. The 13-story Lone Star Gas Company Building (the second building built in the complex) is by far the most ornate and best preserved. Designed by Lang & Witchell — a prominent Dallas firm from 1910 to 1942 — the landmark tower was completed in 1931 and represents one of the city’s best examples of Art Deco architecture. Ornate lanterns accompany relief carvings depicting various aspects of the natural gas industry. 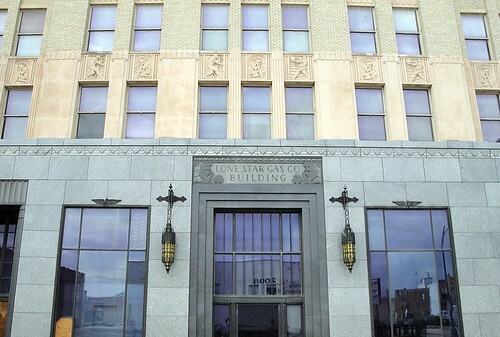 The building fronts Jackson Street, but equally significant entrances are found on both Jackson and Harwood Streets (a separate elevator lobby entrance also faces Harwood Street). The Lone Star Gas Co. Building facade along Harwood Street. 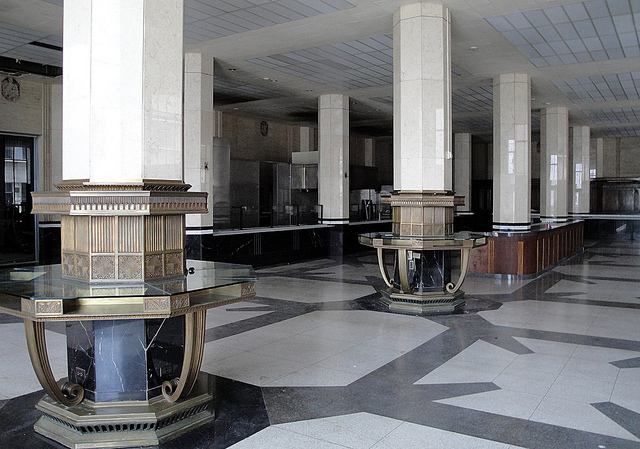 The ground floor of the Lone Star Gas Co. Building is the best preserved area of the complex. It was dedicated to bill payment and customer service areas, during a time when paying your gas bill meant a trip downtown. The lower levels were the public face of Lone Star Gas, and were accordingly built to impress. The bill payment lobby looking from the Harwood Street entrance. Despite modifications, many of the Art Deco elements remain. Insensitive renovations changed and “modernized” the complex over the years. As fewer people made the journey downtown, the bill payment area was converted to an employee cafeteria. The teller counter was converted to a food serving line, the ceiling was lowered and fluorescent lights were added. Despite this, many elements have survived. Near the rear of this space remain several partitioned offices lined with Texas hardwood beautifully carved in Art Deco motifs — craftsmanship that is rarely seen today. Near the top of the walls are additional relief sculptures set into cream-colored stone. 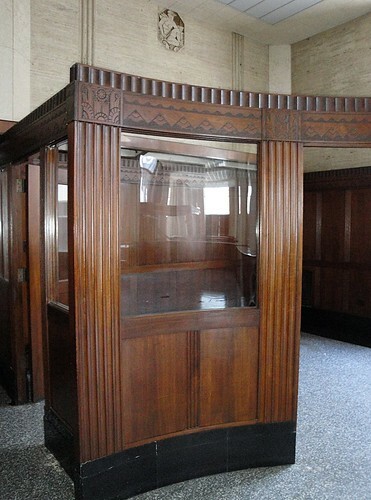 Wood paneled office spaces with Art Deco carvings remain in excellent condition. Many of the bronze fixtures remain, including two large customer check desks, an ornate clock and decorative railings. The original black porcelain water fountain and metal safe (located behind the teller counter) also remain. The original “high beamed ceiling done in brilliant colors” was hidden and believed lost. 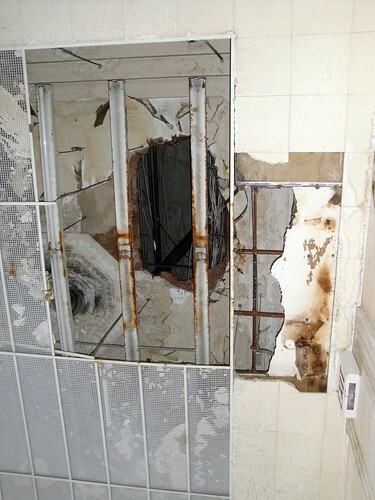 However, recent investigation has revealed that the original ceiling is somewhat intact above the drop ceiling, and could be restored if conditions are right. Redevelopment plans hope to see this large area restored and converted into retail space. A bookstore for downtown residents and visitors would be a perfect fit for this ornate and timeless space. 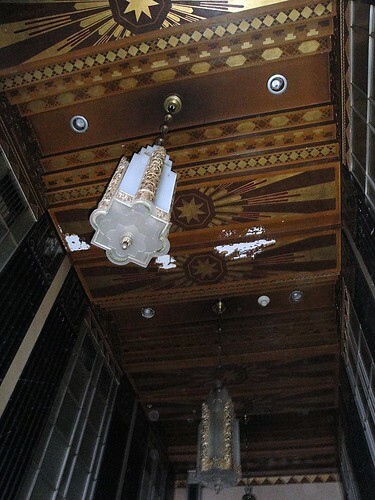 Adjacent to the main customer lobby is the elevator lobby, mostly intact from its 1931 appearance. The dark black marble walls are punctuated by elevator doors featuring beautiful blue Art Deco designs. Ornate lanterns hang from the boldly painted ceiling; a dramatic clock and letter box help frame the space. The space is reminiscent of the Dallas Power & Light Building (another 1931 Art Deco structure designed by Lang & Witchell). With a little bit of cleaning this space could really shine. Other areas of the Atmos complex were less fortunate in escaping design trends over the years. 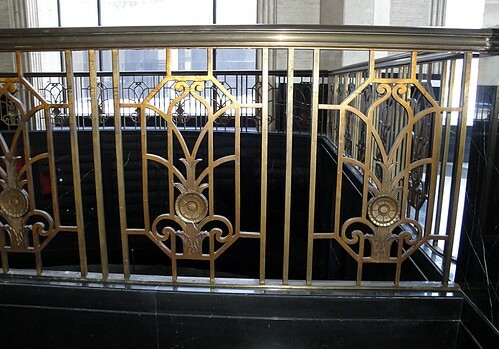 The interior of the Dallas Gas Company building is generic, and the elevator lobby leaves much to be desired. The complex contains corridor after corridor of defunct office space, numerous staircases and many connecting passageways. 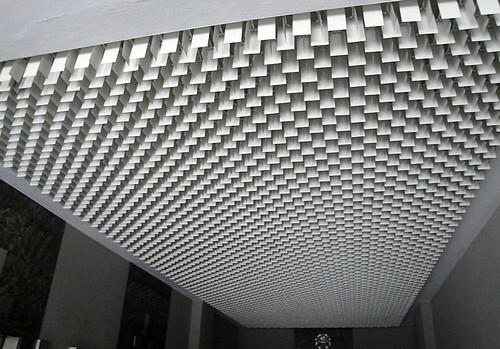 While very unique, this mid-century drop ceiling doesn’t quite fit with the architecture of the Dallas Gas Co. Building. Bringing the building back to life will be a challenge, but Hamilton Properties has done it successfully before. Fortunately the building has remained secure from the elements and trespassers. 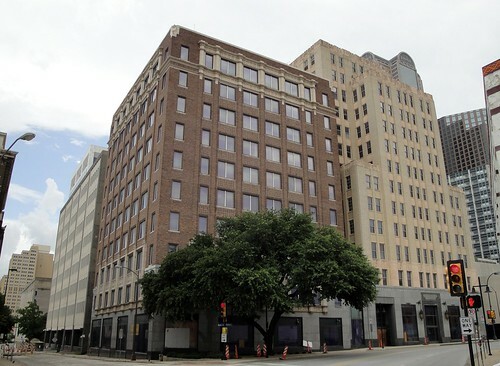 The West Building (which connects all buildings in the center of the block) will become residential parking; Dallas Gas Co., Lone Star Gas Co. and Enserch Plaza will become mixed-income apartments. Just a short stroll to the Dallas Farmers Market and Main Street Garden, the Atmos Lofts could become a highly desired address within a restored Dallas landmark. Adding residents and bringing this building back to life will be a big boost for the Harwood Historic District. Additional photos of our tour can be found on Flickr. Newspaper articles reveal some of the functions and details of the Atmos Complex buildings; we’ll share more of their histories in future posts. 14 Responses to "Lone Star Gas Building, Part I"
My grandfather started working in that building as a legal secretary in the 1930’s and retired as Chairman of the Board in 1977. His entire professional career was spent in The Lone Star Gas building. Great to see the pictures…brings back some good memories. Beautiful — and thanks for the flickr link! I worked for Lone Star Gas Co. for 30 years, starting on November 29, 1967 in the newer West Building. I never got to work in the older buildings, buy my job of 27 years of distributing the Daily Drilling Report took me through all those interconnecting corridors and floors. I cashed my weekly checks at one of those beautiful teller cages. I ate almost every day in the Flame Room cafeteria (not shown), the basement of the North Building, with its beamed ceilings and beautifully tiled floors and walls. I also enjoyed visiting the penthouse of the North Building where the architect Hal Dyer had his offices. You’d take the elevator to the 12th floor level which was also the auditorium, then climb the stairs to the 13th level where the penthouse jutted up off of the roof. For a long time it was vacant and I could climb out one of the windows onto the roof. Was Mike’s grandfather L. T. Potter? It’s sad to see such beautiful architecture sitting empty and unused. Unfortunately this is a sign of the times all over. Hopefully the right entity will happen upon this site and make something of it. My Grandfather worked as a welder on the LSG building when it was being built. My mother retired from LSG. I am looking for a picture of the blue flame. Can anyone help? Hi Jan, are you talking about the blue flame that’s on the Wood facing side of the south tower? There’s also a neon sign that is going to be restored, is that what you speak of? Not many people know this but at the top floor is where the show Dallas filmed JR Ewing’s office. I was employee at TXU in 2000 and my co-workers and I managed to roam around and find it! It was definately retro 70’s! I worked for Lone Star Gas and Lone Star Producing Company (later Enserch Exploration) as a petroleum engineer from 1957 to 1882, a total of 25 years. I worked in the three oldest buildings in the Dallas complex as well as the park Street building across the street to the south of the complex. During that time I witnessed the construction of the two newest buildings. One of the things I remember about these buildings is that Lone Star generated its own electricity and was not even connected to the TXU electrical system. fred bethurum got me my first job working in the mail room.i remember we used to have 2 hour lunch and we would play dominos.it seem there was a person named tommy that worked in the mail room.at 72 my mind is not what it used to be but I dd have some good memories of the gas company. My father worked for Lone Star Gas from 1968 to 1988. I remember a 45 record he brought home to me with the song the Cool Blue Flame! I always thought the building was unique and very pretty! My dad worked his entire adult life, for 40 years, at Lone Star Gas/Enserch . He was in management in Dallas for eight years before becoming the Regional Manager in Houston. Now, I seem to remember is that there was another Lone Star building south of I-30. There was a small quadrangle cut out of the building, and my dad said it was because the owner of the land wouldn’t sell. So, they built around it. Sound familiar to anyone? Would someone be able to fill in the blanks of the officer core of LSG cerca 1984? Any updates to this story (besides the Lone Star Gas Building Part II)? Have they saved the beautiful architectural elements you described and showed in this article? It would be a crime to see such beautiful elements destroyed!